The Education Bureau today (February 20) announced the launch of the Hong Kong Scholarship for "Belt and Road" Students (Thailand) with a view to attracting outstanding Thai students to pursue undergraduate studies in Hong Kong in the 2017/18 academic year. The Secretary for Education, Mr Eddie Ng Hak-kim, reached an agreement on the scholarship scheme with the Minister of Education of Thailand, Mr Teerakiat Jareonsettasin, after a bilateral meeting in Bangkok, Thailand, this afternoon. 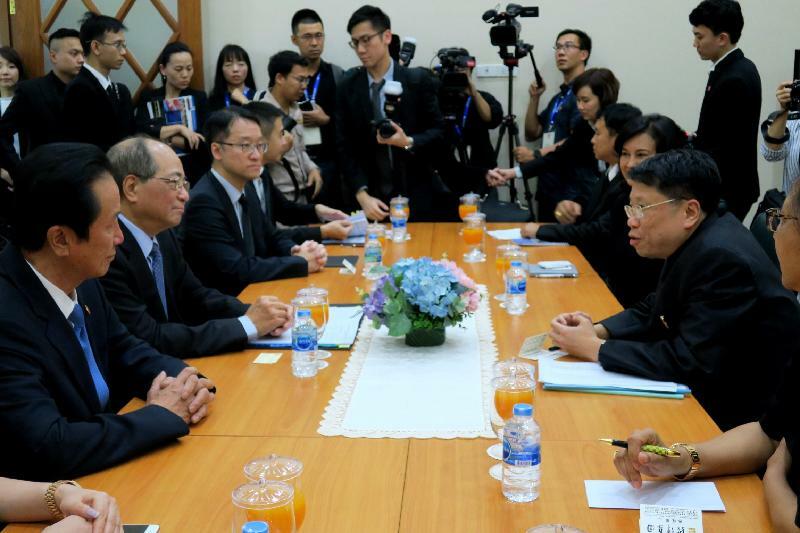 The launch of the new scholarship scheme is a significant milestone since the signing of the Memorandum of Understanding on education co-operation between the governments of the Hong Kong Special Administrative Region (HKSAR) and Thailand last month. "Hong Kong is Asia's world city. It is gratifying to note that the University of Hong Kong (HKU) has been ranked the most international university in Asia and the world's third most international university according to the latest Times Higher Education World University Ranking. With HKU and the Chinese University of Hong Kong, the HKSAR claimed two places in the top 30 of the world," Mr Ng said. "We won't be complacent and will continue with our efforts to consolidate Hong Kong's role as a regional education hub in Asia. The new scholarship scheme can further internationalise and diversify the Hong Kong higher education sector and enrich our pool of human capital with talents with global vision and international networks. 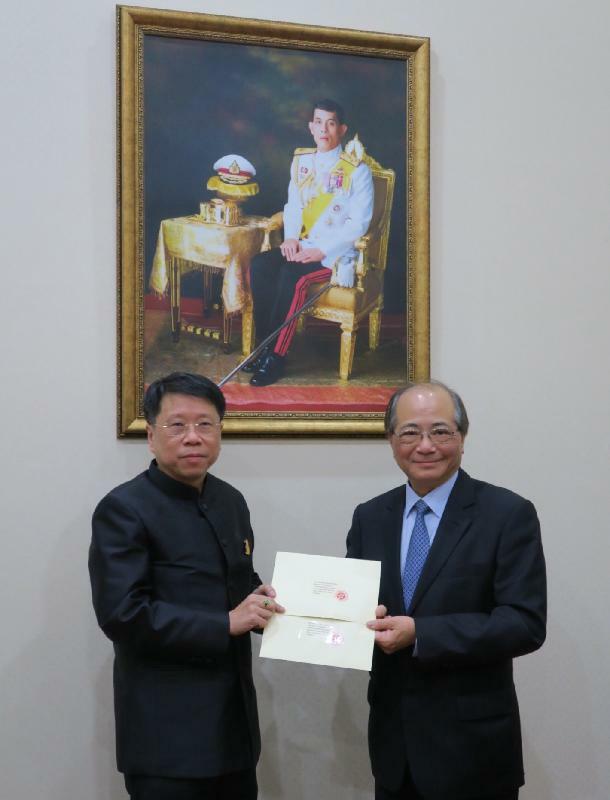 At the same time, the scholarship awardees can act as ambassadors to strengthen exchanges and people-to-people bonds between Hong Kong and Thailand." Supported by a donation from the Chairman of the Hong Kong China Chamber of Commerce, Mr Chan King-wai, and Hong Kong King Wai Group Company Limited, up to 10 scholarships will be offered annually to Thai students who are enrolled in undergraduate programmes of publicly funded institutions in Hong Kong for three academic years starting from 2017/18. All awardees will receive a scholarship of up to HK$120,000 per annum to cover tuition fees. In addition, each financially needy awardee will be provided with a bursary of HK$50,000 per annum. Details of the new scholarship scheme are available in the "Study in Hong Kong" website (www.studyinhongkong.edu.hk/hk/hong-kong-education/scholarships.php). The Hong Kong Scholarship for "Belt and Road" Students (Indonesia) was launched in 2016/17 aiming to attract outstanding Indonesian students to study in Hong Kong. Ten Indonesian students have been awarded the scholarships and they are pursing undergraduate studies in Hong Kong. The Education Bureau announced in November 2016 that the scheme would be extended to cover Malaysian students in 2017/18.